Flying through the air with the greatest of ease — that’s what comes to mind when you jump on an in-ground trampoline. Rebounding — jumping on a trampoline — is fun and healthy. We offer these 3 in-gound trampoline safety tips. They are common sense and items most people who use in-ground trampolines already know, but it’s never bad to have a refresher on safety tips, right? Right! Remove jewelry. You may not have considered this, but remove necklaces, earrings, bracelets and even rings that might get caught when you’re jumping on an in-ground trampoline. Put a little jewelry container next to the in-ground trampoline so it’s convenient to remove them and retrieve them. You don’t want to snag the trampoline surface, nor do you want to risk falling and somehow having an earring or necklace get caught on the trampoline. Keep it clear. 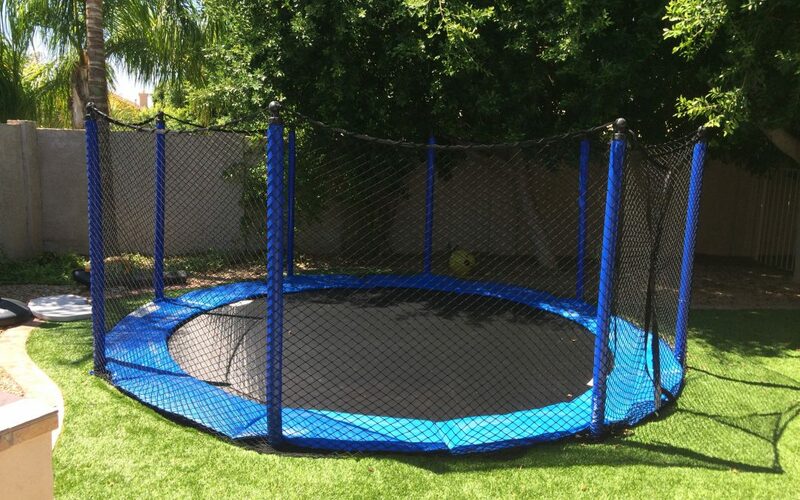 When the in-ground trampoline is installed, look at the area where you are putting it with a critical eye. Are there any overhead wires? Any low hanging tree branches? Are you close enough to the house that you could hit the roof or gutters? A clear, open space is the safest placement for your in-ground trampoline. Safety accessories. In-ground trampolines are inherently safer than above ground trampolines, but you still need to check it to assure it’s safe every time you use it. Make certain the pads are covering the springs. Check the springs to assure they are all in place and that none of them are rusted. 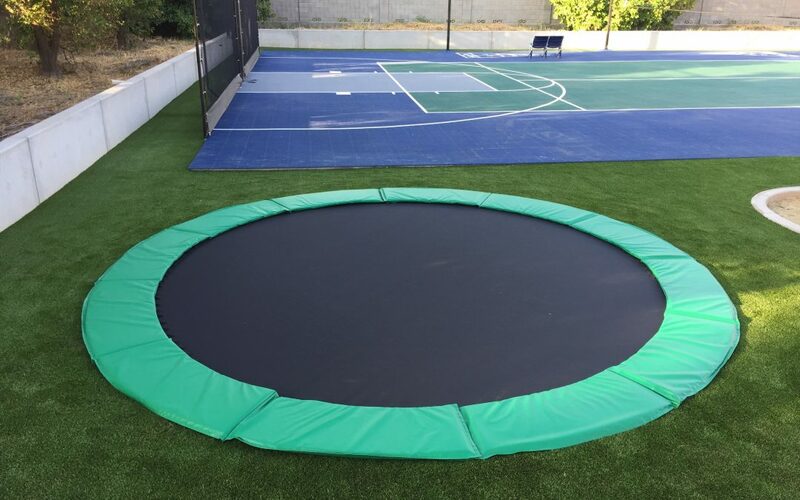 You can add an enclosure to an in-ground trampoline, although many in-ground trampoline owners opt to not do that as it detracts from the sightlines — it is a personal call. Check the bounce area of the in-ground trampoline to assure they are safe as well. Take off your shoes and prepare to jump your way to fun and good health on an in-ground trampoline. Let us know if you have any questions about safety or other in-ground trampoline information you’d like. When is the last time you went barefoot? We currently live in a time where children (and adults) wear shoes most of the time. We’ve moved away from the joys and health benefits that being barefoot brings. Benefits of barefoot rebounding also figure into the “ditch the shoes” movement we want to start! Being at one with nature means trodding the ground without shoes. When we were children, chances are the soles of our feet were as “tough as shoe leather” because once summer vacation started, we kicked off our shoes and didn’t put them back on until September and school started again. Because we are always wearing shoes, our feet can no longer cope with climbing on rocks, stepping on pebbles or thorns or managing to walk on a hot sidewalk or road. When you feel the ground beneath your feet you have better balance. Walking barefoot helps your vestibular system — your balance. This is important for senior citizens to help them keep from falling. Your health begins with your feet. Diabetics run the risk of many foot issues and those who are overweight are at risk of diabetes. Keeping your feet healthy starts when you’re young and goes throughout your life. A little dirt is good for you! When you walk barefoot you are stimulating your nervous system and this can help improve your immunity. Going barefoot will help strengthen you, enhance your balance and when you’re barefoot on an in-ground trampoline it’s just more fun! Take off your shoes when you’re on the in-ground trampoline and you will have better balance and will be better able to feel the give and bounce of the trampoline beneath you. You can feel the sun-warmed trampoline beneath your toes and you will be helping your balance as well as your overall health by rebounding.